Russian ombudsman to examine Ulyukayev case if requested by ex-minister | Russian Legal Information Agency (RAPSI). MOSCOW, December 18 (RAPSI) – Russia’s High Commissioner for Human Rights Tatyana Moskalkova will scrutinize a case of Alexey Ulyukayev sentenced to 8 years in high security prison for bribery if the former minister complains about violation of his rights, the ombudsman told journalists on Monday. Moskalkova does not consider the sentence given to Ulyukayev as politically motivated, the ombudsman’s press service has told RAPSI. However, she concedes that mistakes may be made in any case, and it must be examined in the most thorough manner, the statement reads. On December 15, Ulyukayev was sentenced to 8 years in high security prison and a 130-million-ruble fine (about $ 2.2 million). The court held that Ulyukayev’s involvement in the bribery was proven by witnesses’ testimony and other examined evidence. His words about innocence were regarded as attempt to evade criminal liability. Ulyukayev was arrested on November 14, 2016, when leaving the office of Rosneft oil company. The Federal Security Service’s (FSB) officers found a bag holding $2 million in cash in his official car. Ulyukayev was charged with extortion a grand bribe. According to the Investigative Committee, he threatened to create obtrusions for Rosneft with the use of his position. On November 15, 2016, he was put under house arrest. Later in the evening, President Vladimir Putin relieved Ulyukayev of his post because of loss of trust. Ex-minister stated that the case was fabricated. The defendant noted that there was a provocation, orchestrated by the Federal Security Service (FSB) and that there was no sound evidence in the case, aside from testimony provided by Sechin. 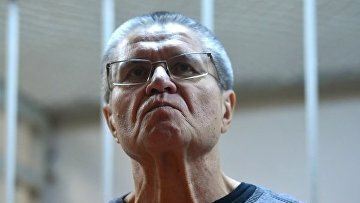 Trial of Ulyukayev began in mid-August. The court questioned 15 witnesses including the Economy Ministry officials, Ulyukayev’s driver, Rosneft employees, journalists and FSB officers. Sechin was summoned for interrogation four times but he failed to appear in court. A judge refused to read out his testimony given during pre-trial investigation. 18:19 18/12/2017 Russia’s High Commissioner for Human Rights Tatyana Moskalkova will scrutinize a case of Alexey Ulyukayev sentenced to 8 years in high security prison for bribery if the former minister complains about violation of his rights.